And without optimizing fare collection, bus stop design, and other aspects of the L train replacement service, bus lanes alone won't be enough to avoid "a stuck-on-the-bus nightmare." The bus lanes DOT plans to implement while the western portion of the L train is out of commission should be in effect all day, every day, Transportation Alternatives says in a new report [PDF]. DOT and the MTA have shown preliminary plans for bus priority on the Williamsburg Bridge and portions of 14th Street, Delancey Street, and Grand Street during the L outage. But DOT says transit-only restrictions will not be in place outside “peak hours,” which have yet to be defined. Rush-hour-only bus lanes won’t be good enough, TransAlt says, since L train ridership remains high on nights and weekends, well beyond the typical definitions of “peak hour.” And once travel demand subsides, the justification for letting general traffic use the bus lanes also fades. Round-the-clock bus lanes are the way to go. 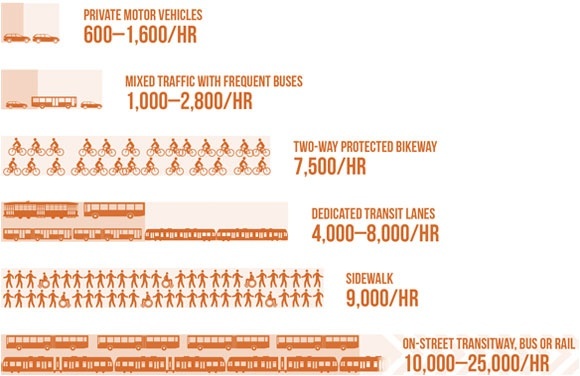 The 24/7 bus lanes are one of five recommendations in the report prepared for TransAlt by BRT Planning International in advance of tonight’s L train shutdown open house on 14th Street. While the outline of a service and street design plan released by DOT and the MTA is a good start, the details matter. Without optimizing fare collection, bus stop design, and other aspects of the L train replacement service, bus lanes alone won’t be enough to avoid “a stuck-on-the-bus nightmare,” the report says, with rush-hour transit speeds falling below 3 mph on the busiest sections of 14th Street. The cumulative effect of all the measures in the report would be dramatic, shaving more than two-thirds of the time off a rush-hour trip between First Avenue and Eighth Avenue (where the baseline assumes only the improvements DOT and the MTA have spelled out so far), the authors estimate. Here’s a look at the other four recommendations. As TransAlt notes, for the most part these steps don’t require a heavy political lift, but they’re critical to ensure that the politically difficult aspects of the plan — claiming street space for buses — yield impressive results. On 14th Street, bus stops should be long enough to allow for boardings of two buses simultaneously, with a passing lane so buses that stop for passengers don’t block the busway. 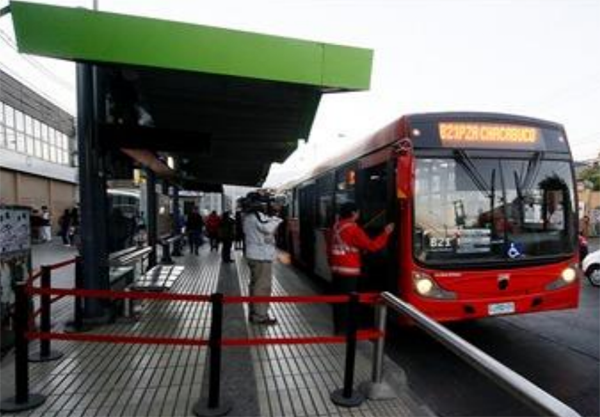 The stops should also be set back from intersections by one or two bus lengths to prevent buses from jamming up. And, crucially, bus stops for all the L train replacement services should allow for level boarding. The DOT/MTA plan calls for modular, quick-build bus bulbs, which the city has installed at some Select Bus Service stops. 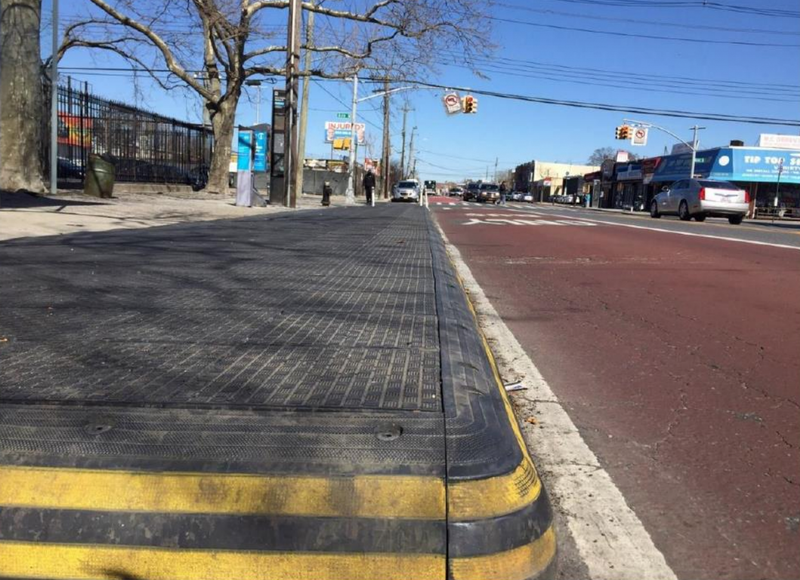 The TransAlt report calls for raising these stops to the same height as the floor of a bus. A quick-install bus stop in Brooklyn. Raising these to the level of the bus floor would speed the boarding process. The preliminary DOT/MTA plan calls for a bus- and delivery-only 14th Street between Eighth Avenue and Third Avenue, with conventional bus lanes between Third and First avenues. But the most intense bus ridership will be in the mornings from the ferry terminal on 20th Street and Avenue C to Union Square, according to BRT Planning International. The authors recommend extending the 14th Street busway at least to Avenue A, or all the way to the ferry terminal. Severe back-ups could result at First Avenue, a transfer point for the Brooklyn shuttle service, if transit-only measures don’t cover the blocks east of Third Avenue. On the Brooklyn side, bus lanes will be needed on Berry and Roebling to speed the shuttles serving the Bedford Avenue area. And a stop on the Grand Street service should be added closer to the bridge to substitute for the Lorimer Street L station and help prevent severe overcrowding at the Marcy Avenue J/M/Z station. Instead of off-board fare collection in the style of Select Bus Service, which depends on periodic on-board fare inspections that would jam up the busway, the L train substitute services should be free, like the MTA’s standard subway replacement shuttle services. If that would break the MTA’s budget, the second-best option would be to demarcate fare control zones around bus stops for riders who’ve already paid. It is unfortunate that the City refused to study Kenmare Street traffic when they did their Delancey study. The truth is, I do not see the feasibility of having the buses travel on 2-lane industrial (and thru-truck route to Holland Tunnel) Kenmare Street and making that sharp left turn into northbound heavy traffic that often clogs the intersection at Cleveland Place, which is the plan for the L-train shutdown. These streets and current traffic cannot handle the expected number of buses. Making the Williamsburg HOV3 is laughable. We need to discourage other uses of the bridge: congestion pricing; eliminate the one way toll on the Verrazano-Narrows Bridge.